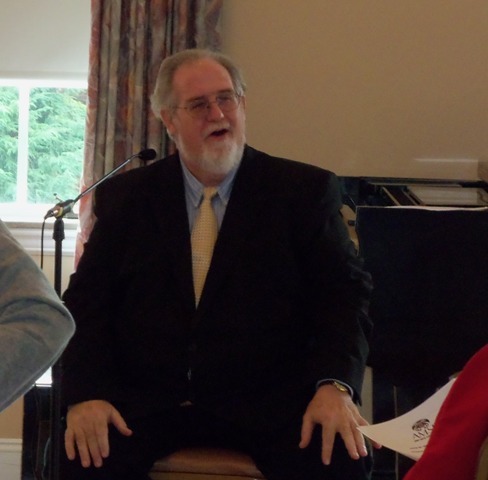 At it's annual meeting on September 12, 2010, AMSF members were treated to a discussion and performance by noted pianist Francis Conlon. Mr. Conlon has appeared at most of the colleges and concert halls in the greater Washington area, and he has performed in many different cities throughout the United States, Canada, Central America, Europe, India and Japan. He has played in New York City at the Carnegie Recital Hall, in Boston at the Gardner Museum, in Philadelphia at the Robin Hood Dell, and in Washington at the Kennedy Center, the Smithsonian Institution, the Library of Congress, the National Gallery, the Phillips Collection, the Corcoran Gallery, the Pan American Union, Dumbarton Oaks, and Wolf Trap Farm Park. He has appeared as concert soloist with many local orchestras, and he has collaborated with countless soloists and chamber music groups. He is on the faculty of George Washington University, and he has taught at Catholic University and the Duke Ellington School of the Arts, and he is Minister of Music at Washington's Church of the Annunciation. Mr. Conlon, who has been called Washington's "ubiguitous pianist" by the Washington Post, said that as a young child he was a "Navy brat" who tagged along with his parents to officers' clubs where he was able to hear combos perform live. He also recalled that he used to enjoy hearing a baby sitter play the piano. When he was only seven years old and living with his parents in Guam, a visiting Catholic priest remarked that the church organist was unable to play during an upcoming mission because she was expecting a baby. Young Frank piped up with "I can do that", and he did. After the baby's arrival, the organist decided not to return, and Frank continued to fill in for her. By the time he was eight, Frank was playing for three services every Sunday! At about the age of 10 or 11, Frank began to play "pop" organ at a restaurant in Norfolk, VA. Frank recounted numerous musical adventures. While in high school, he was fired from a job playing "honky tonk" piano--but not for a lack of talent, rather because he was underage. Frank's musical education was somewhat erratic. He attended Georgetown Preparatory School where there was no music program. However, there was a Jesuit brother who was a "brilliant pianist", so Frank asked him for lessons. The lessons were abruptly terminated when Frank posed a question that was not well received, though they ended up on friendly terms. Thus it was that even though Frank did not have formal piano lessons while in high school, he continued to involve himself in music endeavors and was even choir director at a naval hospital. Frank's "big break" came when he was hired to play at Washington Hay-Adams Hotel. Frank stated that his musical life has been one of "doing". His resume attests to the "doing". Frank has served in many musical roles--as chamber player, soloist, choir director at churches and synagogues, musical director, and teacher. Frank's statement that "you have to be a gambler to perform and want to share who you are with people" is a true reflection of the nature of this generous and outgoing performer. At the end of his remarks, Frank answered members' questions about memorization, sight reading, and practicing. With regard to sight reading, he recommended starting out with music that is easier than what you are currently working on. Give yourself a tempo you will be good at. In practicing, set a goal such as a page a day. Study the score beforehand. Frank stated that he studies music before even putting his fingers on the keyboard. After his presentation, Frank performed the adagio movement of Mozart's last sonata, K 576 in D Major, Debussy premier livre, no. 10, "la cathedrale engloutie", Chopin Nocturne in A flat Major, Opus 32 No. 10, and the third of Gershwin's Three Preludes, "allegro ritmato e deciso".